I liked that it was a story that definitely had a middle and end. I would recommend it to everyone who likes a HEA. Shanora Williams just woos me time and time again. Doomsday Love is a heart wrenching story about two lost souls wandering through life, not living, not existing until they find one another. Drake Davenport is the mysterious, MMA fighter, bad boy from the wrong side of the tracks. Jenny Roscoe is the sweet, thoughtful and curious girl, that lives life with an open heart. Drake and Jenny first become the oddest of friends when they are ten. Without words, they both see the other, and they understand the pain they each carry due to loss. As they grow, they both take different paths and lose track of one another. When their paths once again cross, Drake acts like he wants nothing to do with Jenny, but deep down he wants her more than anything. Eventually Jenny becomes Drakes everything. Tragedy once again plagues Drake and he questions everything in his life, eventually tearing him apart and away from Jenny. Leaving is his only choice, breaking Jenny's heart forever. Pinning away, waiting for Drake, Jenny soon realizes that he is never coming back so she moves on without him. The loss of Drake changes Jenny in unimaginable ways, turning the vibrant open hearted woman to a non-existing shell. 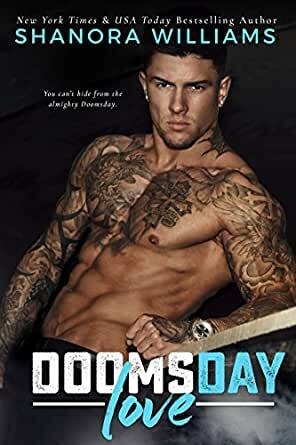 I LOVED Doomsday Love. It was filled with diversity, challenges, desires, innocents, violence, hope, love and acceptance. Shanora Williams just keeps amazing me with her ability to pull you in, experiencing the story as if your living it. BRAVO Shanora, BRAVO!!!!!! 5.0 out of 5 starsOne of My Favorites of 2016! I loved this book! I don't know what else to say. This book devastated me and is one I will not forger. Shanora has once again proven she can write an experience. I was given ARC for an honest review. I love Doomsday Love. I couldn't put down. Drake and Jenny their story begins while both them were young. Drake comes for not good home environment. Jenny comes for money. Both them found friendship one other. They struggles through tragic events in their young life. Now eight years later Jenny goes to public school on her senior year of high school. She always wondered happened with Drake all those years. When she runs into Drake, it's still the same between both them. Drake doesn't like open and give himself away. He feels he doesn't deserves love by Jenny. He is drawn to Jenny but can't understand why she wants him. He believe he is not good enough for her. He's fighter when he is in the cage. He turns into the beast. He's father hate him. Only good thing he has in his life his grandma. Jenny wants to show him that she has enough love for the both them. Tragic event happened again in Drake life. He made decisions. Hearts got broken. Four years later, fate brought Jenny to fight in Vegas where Drake is fighting big fight. Drake sees Jenny. Now he needs to prove her. That he is able give all the things she needed all those years ago. Can Jenny let go the past and see true happiness they can have together. I would love to read more about Kylie, Oscar and Otto.